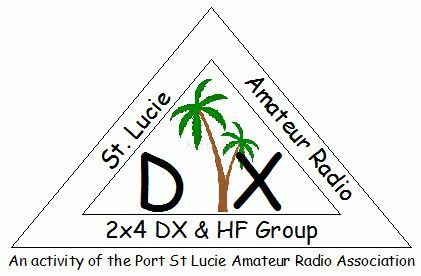 The 2x4 DX & HF Group is an activity of the Port Saint Lucie Amateur Radio Association. Group members share a common interest in HF communications. In addition, many of our members actively participate in DX activities and have either achieved, or are working toward achieving, DXCC and other operating awards. The group’s common interest is anything HF operating, listening, or contesting related. Read on for additional information about the 2x4 DX & HF Group. The mission of the 2x4 DX & HF Group is to provide a friendly forum for the discussion and encouragement of DX and HF communications. We welcome both members and guests to participate in our meetings, nets and other activities, regardless of experience level. We offer a forum for seasoned hams, and learning opportunities for less experienced hams and non-hams who share a common interest in HF communications. Who can join the 2x4 DX & HF Group? Any ham (or non-ham for that matter) with an interest in HF communications or DXing is invited to join the group. Although membership in the main club is encouraged, you do not need to be a member to participate in the DX group. Shortwave listeners who enjoy monitoring the HF bands are also welcome to join us. From beginners to experts, everyone is welcome. Not experienced in HF skills? Not a problem. Join our group and learn from the pros! Are your members all serious DXers? No, they are not. We are proud of the fact that some of our members are on the DXCC Honor Roll. We also have members will lesser DX and HF experience. We even have some new hams with limited or no HF experience, but with a desire to learn. We welcome all experience levels, from beginner to expert, including non-hams. Are dues required to join the 2x4 DX Group? No. There are no dues. Further, we don’t sell 50-50 tickets. Nor do we offer chances of any kind. Just show up at the meetings. There are no financial obligations necessary to participate in the group. When does the 2x4 DX Group meet? Our meetings are held on the 2nd and 4th Wednesdays of each month at 9:00 AM. The group meets at Saint Andrew Lutheran Church, 295 NW Prima Vista Boulevard, Port Saint Lucie, Florida. We meet in the small meeting room on the west side of the church property. What happens at 2x4 DX & HF Group meetings? After the formal meeting agenda we often have a short presentation on a DX or HF operating related topic. Then, post-meeting, we typically adjourn to a nearby café for coffee and pastries. How long are the 2x4 DX & HF Group meetings? Meetings typically last about 45 to 50 minutes. Presentations usually last about 15 to 20 minutes. We then adjourn and go for coffee. Does the 2x4 DX & HF Group have any on-air nets? Yes we do. Nets are scheduled on the 1st, 3rd and when necessary 5th Wednesday of every month at 8:00 PM local time. We meet on the Port Saint Lucie Amateur Radio Association repeater, frequency 146.955 MHz, offset -600 KHz, tone 107.2. Our nets are moderated by a net control operator. All licensed hams are welcome to participate. If new to our net, just follow the instructions of the net control operator. We look forward to hearing you on the air. How can I get further information about the 2x4 DX & HF Group? Stop by at one of our meetings. Speak to us at a Port Saint Lucie Amateur Radio Association general membership meeting. Drop an email to 2x4DXGroup@gmail.com. Does the 2x4 DX & HF Group offer a newsletter or monthly mailing? We are working on assembling a small email-style newsletter. To be included on the distribution, please drop a line to the email address shown above. Can you tell me more about the Port Saint Lucie Amateur Radio Association? We sure can. The main club holds its monthly general membership meeting on the 4th Wednesday of every month at 7:30 PM. Meetings are held in the Fellowship Hall of Saint Andrew Lutheran Church, 295 NW Prima Vista Boulevard, Port Saint Lucie, Florida. The Fellowship Hall is the large meeting room located on the north side of the church property. Other club activities include a monthly breakfast get together, spring and fall picnics, a holiday party and more. Plan to stop by at a meeting. Visitors are always welcome and we would love to meet you. For additional information concerning the Port Saint Lucie Amateur Radio Association, send an email to info@pslara.com. Thanks for visiting our web page. We hope to see you at an upcoming meeting.